Torch Lake Township EMS department. 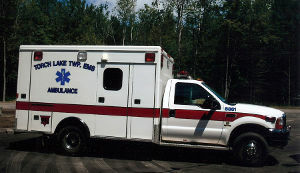 Torch Lake Township's EMS department was formed in 1997 and is licensed as a basic life support transporting ambulance service - allowing us to provide initial patient care and transportation to those in need. When indicated, we can also call for an Advanced Life Support Unit which meets us on the way to the hospital. Our crew consists of twenty-four members including five Paramedics, five EMT Specialists, ten EMT - Basics, three medical first-responders and one in training. While a few of these folks are locals, the majority come from surrounding areas. Most work both part-time here and full-time for other ambulance services. Our primary ambulance is staffed with a minimum of two crew members at any given time. One member is always with the ambulance and a second is rarely more than 5 minutes away. Our "out the door" response time averages under 4 minutes and (under normal weather conditions) we often respond to events within Torch Lake Township in under 9 minutes. EMS services are funded by a combination of "run fees", taxpayer support, grants and gifts. Most insurance policies cover some or all of the cost of emergency ambulance services. To take advantage of these funding resources, the township bills for applicable ambulance transports. Rates are realistically set for most common insurance providers - including Medicare and Blue Cross Blue Shield. To help those without funding or assistance, the township Board adopted a policy to waive fees for those truly indigent. Need to borrow a piece of medical equipment? The EMS department has a variety of items available - including bath seats, shower seats, walkers, wheel chairs, crutches, canes, commodes and toilet raisers. Loans are first-come, first-served and there is no set length of time associated with loans. Our loan-out program does not receive funding and is supplied strictly through donations from folks who have durable medical equipment which they no longer need. If you need of a piece of equipment, simply stop-in and ask any EMS official on duty. If you have a piece of no-longer-needed medical equipment, please consider donating it to our program. Please consider reviewing our EMS Privacy Practices Policy.